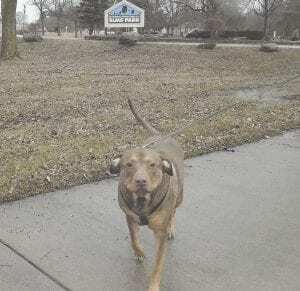 Lucy takes an afternoon stroll in the rain last week at Elms Park nearby in Swartz Creek. Her owner, Sean, keeps her on a leash for safety. Later this year, however, Lucy and other dogs will be able to romp untethered in a fenced area built just for them. Local brothers Eric and Ryan Melen have been raising money for their Eagle project for a couple of years now, and they’re just about $1,500 shy of their $8,000 target thanks, in part, to the GFWC – Swartz Creek Women’s Club.